When going on holidays or traveling, it is always nice to have a convenient, portable sized iron to get rid of any unwanted wrinkles that packing may have created. Something small and lightweight, that enables the user to iron regardless of what country you may be visiting. The Quest travel steam iron may fit the bill. Created by the Benross Group, this Quest iron has all of the functions that you may need to smooth out those pesky lines from your clothes. With its Aluminum and plastic construction, the iron is very lightweight and takes up very little space in your luggage. It comes with a fold down handle and removable water tank for easy storage. Weighing only 566 grams, this handy little steam iron won’t put you over your weight limit for flying. Regardless of where you are traveling, this iron has a switch to easily change from 115V to 230V. This is a great little feature for a travel iron to have and makes converting a breeze. It also comes with a 1.75m cord so wherever the outlet is in your home away from home, you have plenty of cable to reach any outlet. The non stick sole plate is perfect for use on any fabric type and with the temperature control knob, you’ll be able to have sleek looking silk, polished polyesters, and crease-free cottons. For items that are more delicate, the Quest travel steam iron features a steam button as well. This function is a must in any travel iron. The Quest travel steam iron heats very quickly and works quite well for short use. If you need just a pair of trousers ironed, or a little summer dress smoothed out, this iron will do the job. Just don’t expect the same quality that you’d receive from sending out your laundry to be ironed at the resort. Although small, the water tank is transparent as well as removable. However, it is very cumbersome to detach and many have complained that after filling, the iron will leak, so perhaps ironing a tea towel or bath towel first, would be a smart idea so you don’t ruin any of your garments. The Steam switch is also very finicky and doesn’t always work. This can definitely impede any quick ironing jobs. Time to hang those clothes in the bathroom while you are taking a hot shower. You’ll have better luck and it will be quicker than fighting with a button! 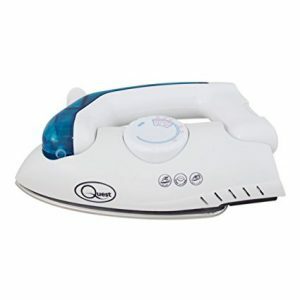 The overall construction of the iron seems at first glance to be quite sturdy, but after using the Quest Travel Steam Iron, I noticed that it can really get hot just above the non stick sole plate. 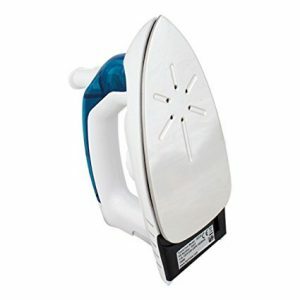 A few times I even noticed a light burning plastic smell if I left this iron on more than 10 minutes. This is probably one of the biggest concerns I have and is actually rather worrisome. Overall, if you are looking for a decent quality steam iron for traveling that actually works and makes a difference on your garments, this could be a great choice for you. The Quest travel steam iron isn’t made as a professional travel appliance, but more as a quick and easy fix for small jobs. 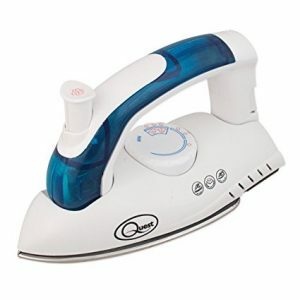 You will probably find that it needs to be replaced after a few trips and although the price is inexpensive, there are many other irons out there in the same price point that will work much better than this little white and blue travel iron.